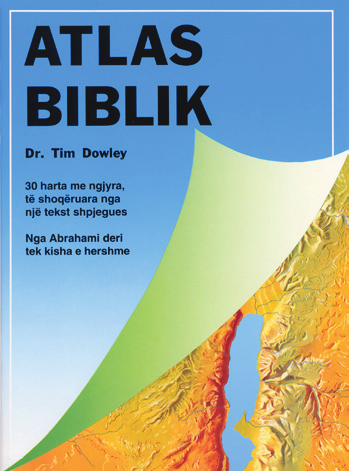 shoq�rojn� histori t� Bibl�s nga Abrahami deri tek kisha e hershme. Ky botim �sht� mjaft i dobish�m p�r student� t� shkollave biblike apo teologjike, si dhe p�r ata q� e lexojn� Bibl�n me nj� interes p�r gjeografin� e historive t� saj apo p�r t� kuptuar dhe interpretuar m� leht� Shkrimin e Shenjt�.
? A book to be kept next to the Bible. Contains 30 colored maps, accompanied by an explanation. The maps show Bible stories from Abraham to the early church. This edition is useful for everyone who reads the Bible and has interest in it�s geography and history. It should be of special interest to students in Bible and theology schools or to anyone wanting to understand and interpret the Holy Scriptures better.